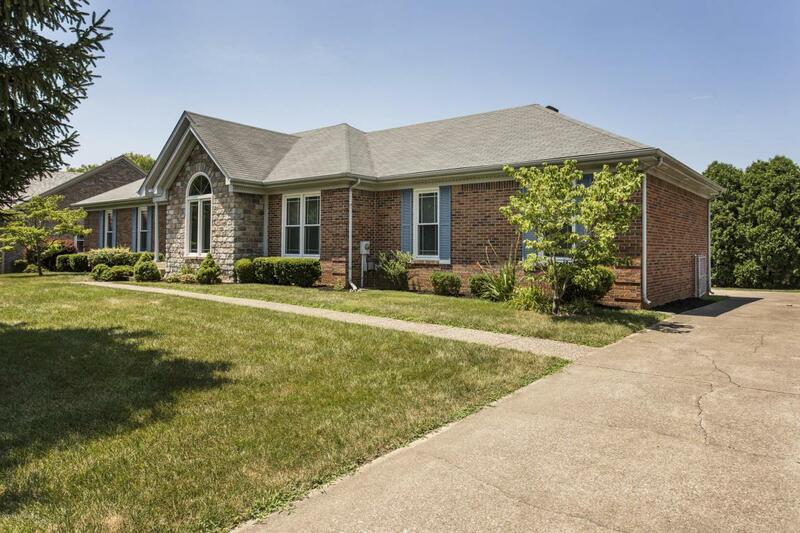 This fantastic, updated WALKOUT RANCH with over 3600 total finished square feet (over 1700 sq ft fin in lower level) is located on a quiet cul de sac in popular Monticello Place in J-town. Off the foyer is a spacious FORMAL LIVING ROOM/OFFICE(this versatile room can be anything you want). Enjoy a cozy FAMILY ROOM with WOOD-BURNING FIREPLACE, and access to the freshly painted DECK. The foyer, living room and dining have HARDWOOD FLOORS. Off the family room is a bright, cheerful UPDATED KITCHEN, that has just been freshened up with painted cabinets, new hardware, stainless sink, new faucet,and beautiful GRANITE COUNTERTOP that provides plenty of preparation space, and GORGEOUS NEW TILE has just been installed. The breakfast area overlooks the beautiful fenced back yard. The FORMAL DINING ROOM offers plenty of extra space for special occasions. You will especially love the MASTER SUITE, boasting a large WALK-IN closet, and new ceiling fan. The pampering MASTER BATH has a WHIRLPOOL TUB separate tiled shower stall, double sink vanity. The SECOND BEDROOM and THIRD BEDROOMS are spacious. The LAUNDRY is conveniently located on the first floor. The finished WALKOUT LOWER LEVEL offers another host of possibilities, a large area currently used as a sitting/tv room, a huge game/play area, an office area and two additional rooms that the current owner used as guest bedrooms. The REAR ENTRY 2.5 CAR GARAGE has room for extra storage. UPDATES to the first floor include painting and new carpet (excluding MBR carpet), new interior door hardware, painted kitchen cabinets with granite countertops, sink, faucet, new hardware, and lots of new lighting and ceilings fans, gorgeous new tile in kitchen and baths. MONTICELLO PLACE in an exceptional neighborhood and is conveniently located near lots of convenient shopping and great restaurants. Historic Jeffersontown is just 5 minutes away, and the freeway is also close by, making your commute very easy. IMMEDIATE OCCUPANCY ! !